Home » Uncategorized » 5 (Potential) Free Agents that Toronto must bring back for 2018. Well it sure didn’t take long for the CFL to transition from the euphoria of another successful Grey Cup week and into the nitty gritty that is the off-season which includes posting all potential 2018 free agents. That the league reveals the list is a bit of a win win for fans of the league who are always craving for more access and information regarding their favourite teams and players. While the league doesn’t reveal contract information in terms of dollars the more fans know about their teams’ off-season the better the league can retain interest and relevancy. The 2017 Grey Cup Champion Toronto Argonauts have 22 players on their roster whose contracts are set to expire. What’s important to note is that the team does still own their rights until free agency kicks off in February of 2018. So what that means is that teams until then do have exclusive negotiation rights with those players and its likely some will never see the open market. As everyone knows the CFL has a salary cap just over $5 million dollars which makes it impossible for every team to bring back every player. Roster turnover is an inevitable and mostly frustrating fact of life in the CFL. Too much turnover is a pain for those having to sell tickets as well. If you’re a new fan of a team familiarity with the players is key to developing a relationship worth spending your time and money on. General Manager Jim Popp has never been a proponent of free agency preferring to go the draft and development route. With that said bringing back your own guys after a successful season is more of a sure bet as opposed to the more expensive route that is unrestricted free agency. Before we get going there are two points of interests that need to be stated. First it’s unbelievable that Toronto doesn’t have a member of its offensive line set to hit free agency. While the unit as a whole wasn’t always spectacular it is an expensive position to fill. The Argos are fortunate to have an O-line filled with a good blend of experience, youth and quality Canadian talent. Secondly Ricky Ray is not on my top 5 list. Of course I’m not against him coming back. It’s just not going to be a decision the organization will need to make. If Ray wants to return Jim Popp will sign him to a contract. That’s it that’s all. So with that said here are my absolute 5 potential free agents that Toronto must bring back in 2018. I’ve factored in skill, age, and even a little marketability in my decision. In this league your Canadian talent is a driving force in the success or lack thereof any team. The native of Edmonton Alberta is only 27 years old and a ratio breaking talent in the CFL. He is not only one of the best Canadian linemen in the league but just one of the best period. Continuing with maintaining your Canadian talent Gabriel fits the bill as well anyone. Like Laing he too is only 27 and with 5 years in the league is now ready to not only contribute but be a key voice in the Argos secondary. The Scarborough native also checks off another point on the list in terms of Toronto reaching fans across the GTA with players born and raised in the 6ix. Posey was signed in 2016 and it’s safe to assume many didn’t know who he was. A practice roster player in 2016 he became a significant member of the receiving group in 2017. While his numbers were not necessarily spectacular no other player has the letters MVP next to their name for 2017. The Argos needs selling points and Posey is now one of those. You don’t let your MVP walk away. Admittedly I wasn’t the biggest fan of Woods when he joined the Argos last May. At the time I was worried that the Double Blue were on their way of becoming a recycled version of the Montreal Alouettes. I have since changed my mind. He’s still only 30 and formed a physical intimidating line-backing core alongside Marcus Ball. Prior to 2017 I thought the Argos were brutal in their ability to tackle. That wasn’t a problem in 2017 and Woods was a key reason why. Green enjoyed a successful comeback in 2017 catching 104 passes for over 1400 yards. 2016 was a wipe out after a devastating knee injury and I don’t think many knew what Green was completely capable of in his return to action. The question now is how many years does the 32 year old SB receiver have left. But for me there are two key factors why Green will be wearing Argo blue next season. First if Ray does comeback he will want his #1 target back with him. 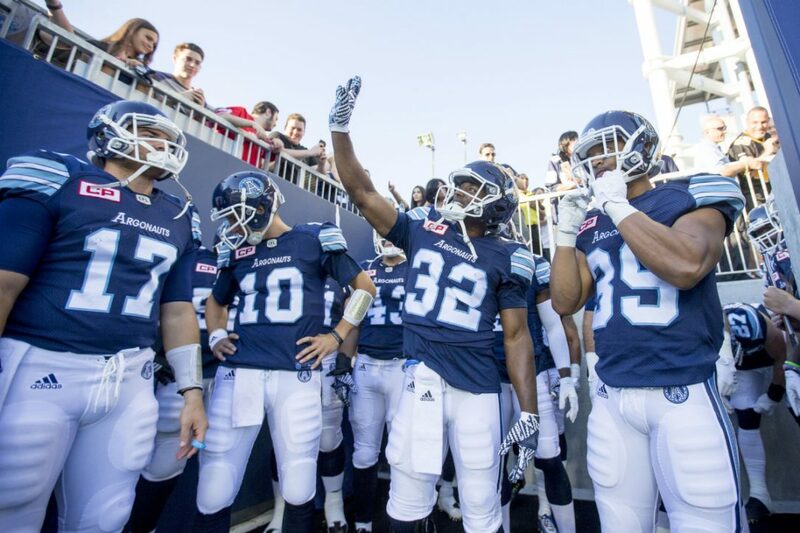 A Ricky Ray resigning is a “lets gather up all the boys for 1 last go around” type of signing. Green is one of the boys. Secondly if Ray does decide to hang up the cleats Green steps in without a doubt as the teams’ vocal and emotional leader. The new quarterback will need Green to help carry on what Ray helped build. 1 Comment on 5 (Potential) Free Agents that Toronto must bring back for 2018. Wow, already looking forward to next season; I’m just getting over the high of the Cup victory. A number of challenges for Popp going forward – unlikely to hold on to all the players he would like.